The platforms with the legs attached, are transported via semi trailer to site. They then are simply lifted off individually and laid on the ground, where the handrail panels are installed. 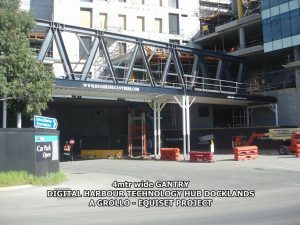 the legs are hinged, so once they are unchained from the platform they unfold into the vertical position and bolted up prior to placing over the footpath. 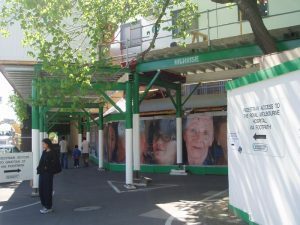 When construction takes place in a busy street or area adjacent to a footpath, or where there is any danger to the public during the course of construction, especially when craning materials from a roadway across a footpath, the Highrise gantry system offers complete and safe protection. 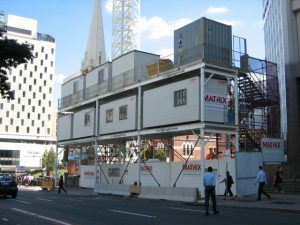 Now that the gantry protecting the public is in position, and you have little room on site for site accommodation or offices, why not utilise the gantry to support your temporary site facilities. 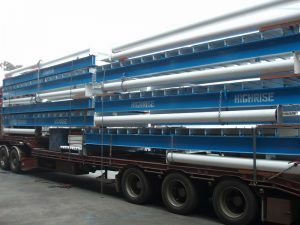 An additional safety feature offered by the Highrise gantry system is the use of our unique “skid board” system. 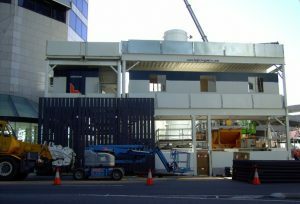 This feature which compliments the outside face of the gantry, offers complete protection to construction loading zones, especially when craning off trucks and hoisting over the gantry. A series of oregon boards secured to set size frames are craned up, and secured to the face of the gantry. 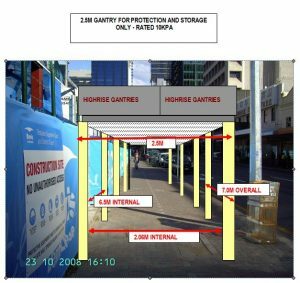 Subject to engineering, Highrise gantries can be used for protection over wider areas, such as driveways and plaza areas, and still have the capability to support sheds or storage above. 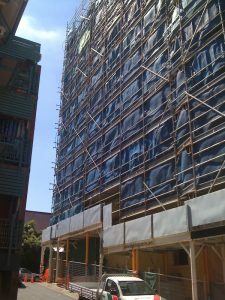 Need to scaffold the building on your boundary line? 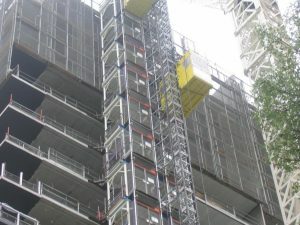 The Highrise gantry system will support a heavy duty scaffold to your building, while protecting the public walking underneath.